Remember when these two were going to carry the NBC Sports Network. I remember it like it was just six months ago. The college football season is a month away but the competition on the field will not be the only battle this season. Potentially, the most important war will be the networks that present the action. Finally a sports war for nerdy camera men. 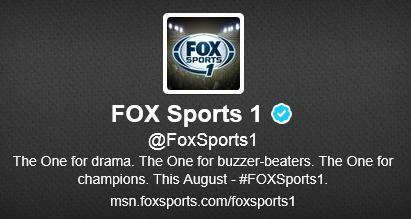 This is the first year for the new FOX Sports 1 network. Combine that with the young NBC Sports Network and CBS, the mighty ESPN may have some trouble. In nerd language this fall will be a video game challenge between four kids who are ultra competitive. Mainly because they’re trying to splint millions of dollars from advertisers. All four of these networks know college football is a great way to score ratings. Building a brand takes more time but once succeeded people around the globe will turn to you first for information. This is ESPN’s strength. Their brand. ESPN is like the evil empire of sports programming. The other three networks wouldn’t even equal the rebel alliance combined. NBC’s and CBS’s sports networks are on upper channels of most cable packages making them tough to find. Even the Olympics and the NHL playoffs do little to bolster the NBC Sports Network. This leaves FOX as the best challenger to ESPN’s reign. Fox is relatively new to broadcasting college football games as they use to only televised the NFL. This left FOX Sports Net to cover non marquee games on a regional basis. Last year FOX began broadcasting PAC-12 and Big 12 games on their local affiliates. These games carried championship implications, something FOX Sports Net never had. FOX even hired away famous sideline reporter Erin Andrews away from ESPN to host their studio show. Now with their own network taking over August 17, one could say FOX now has all the ingredients to take a bite out of ESPN’s monopoly. Maybe, but it’s going to take time. People are so use to changing the channel to ESPN that flipping over to another station like FOX will not come easy. If FOX can land big games again and have great coverage the rest of the week it just might work. One thing for sure is FOX has confidence. Just take a look at their Twitter account. The weakest of these four networks is by far NBC. The NBC Sports Network covers the NHL, and international soccer. Something college sports fans from the South couldn’t care less about. Sure it covers the Olympics but that does not happen regularly enough to carry momentum. The solution appeared to be stealing away ESPN personalities like Fox did with Erin Andrews. NBC Sports Network launch a new show called the Crossover in January starring Michelle Beadle. Beadle gained fame from her days on ESPN’s Sportsnation. It looked the show could compete with the 6 p.m. Sportscenter from commercials, but watching the first few episodes were forgettable. Beadle and her co host Dave Briggs had no chemistry, and the content was stuff a kid could find on Yahoo! The best celebrity’s on the show were probably the first three picks of the WNBA draft. In the spring the show spent more time talking hockey than basketball because NBC had the rights to the NHL. By May, Briggs had been kicked to the curb and Beadle tried to do the show on her own. Beadle even tried to say she didn’t want a co-host in the first place. Thankfully, the Tour de France gave the show a three-week hiatus. Needless to say I didn’t miss it. Beadle comes across as cynical to the point where she is not very likable. Chris Mannix of Sports Illustrated has guest hosted the show numerous times now and may be a better fit. The Crossover is now nothing more than a salvage operation. The only edge NBC Sports Network has left is the Dan Patrick Show, which is more entertaining and informative than ESPN’s Mike and Mike in the Morning, and far superior to Stephen A. Smith yelling on Frist Take. Then again an episode of Stargate Universe is superior to First Take and that’s saying something. Building a brand in sports media is not easy. Let’s just hope Fox can learn from NBC’s mistakes.